Scientists believe that over the past 600 million years, oil has been formed deep in the earth from the decay of plant and animal remains, especially microscopic plankton, after being heated and compressed under thick layers of rock. After formation, oil and natural gas are often found together in dome-shaped geological "traps" deep beneath the surface of the earth. Crude oil and its more viscous form, bitumen, have naturally made their way to the surface of the earth in "oil seeps" that have been used by humans for thousands of years. As early as 5,000 years ago, ancient Sumerians, Assyrians, and Babylonians used asphalt from seeps along the Euphrates as mortar and for waterproofing, and ancient Egyptians were known to use liquid oil for medicinal purposes and in embalming. In North America, Native Americans used tar as an adhesive and to bind stone tools to wooden handles. Oil has continued to be used for a variety of purposes including lubrication, fueling torches, waterproofing, and caulking ships up to the present day. Persian military forces use oil-soaked flaming arrows during the siege of Athens. Using bamboo poles, oil wells as deep as 800 feet deep are drilled in China. The Italian explorer Marco Polo, visiting the Baku region on the shores of the Caspian Sea in modern-day Azerbaijan, notes local people collecting oil from seeps. He writes, "Near the Georgian border there is a spring from which gushes a stream of oil, in such abundance that a hundred ships may load there at once." 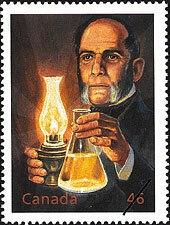 A Canadian postage stamp celebrates geologist Abraham Gesner, the "Father of the Petroleum Industry." Intended as a gout treatment for the Holy Roman Emperor Charles V, oil is exported from Venezuela. The word petroleum, Latin for "rock oil," is first cited in a work by German mineralogist Georg Bauer. Lewis Evans' "Map of the Middle British Colonies in America" contains the first written record of the presence of petroleum in Pennsylvania. Oil was the source of the ancient Temple of Fire at the Temple of Hathor, in Dendara, Egypt. Native Americans teach George Washington's troops how to treat frostbite using oil. A newspaper ad for "Seneca Oil," named after the Native American tribe, pitches oil as a cure-all tonic to New World settlers. Several streets in Prague are lighted using petroleum lamps. Canadian geologist Abraham Gesner distills a new lamp fuel from petroleum, which he calls kerosene. This new cheaper, cleaner-burning fuel will eventually replace the use of whale oil in lamps. Gesner, though he never became wealthy from his discovery, will later be known as the "Father of the Petroleum Industry"; his invention has been credited with helping save the whales.